This weekend I made my debut in a Lidingö shirt at the Leksand Elitserien race. I will put my maps up sometime but results are here, splits here. 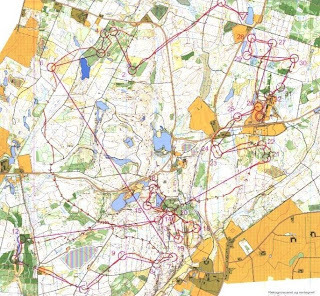 Sunday was Siljankavlen, a four person relay with the same event centre. I ran last leg and pulled up 4 places to finish 7th. Results here, other details available here. 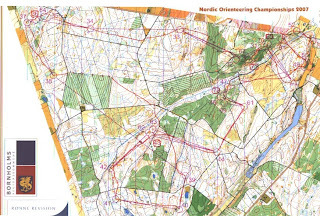 I ran pretty good in both races, but I still made a few small mistakes on Saturday, and one big mistake (about 2.30) in the relay. I am now staying in Stockholm until Wednesday, then we are going on a training camp in Finland in preparation for Jukola. Being ill after the JK meant that my preparation for NOC was far from ideal. With about a week and a half to go before the first race, I resumed training and felt awful. I ran a short fell race and came 3rd (feeling awful). My housemate won it - the first time he has ever beaten me in a race. I finally started feeling better at the weekend. 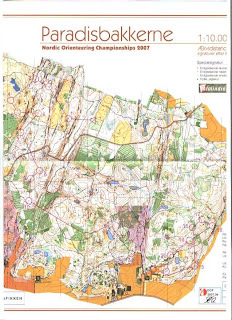 Liis and I went up to the Lake District to chill out and do a couple of small races. 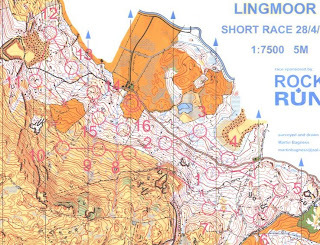 Saturday was a short race on a really hilly area - Lingmoor. After the race we sunbathed on the top of the hill on the map (SW corner). We also saw a sheep giving birth to two lambs. Sunday we took part in a race on Harrop Tarn. I felt really good, cruising for the first 3/4 then pushing it towards the end. Liis and I also went to the wedding of Jules and Becca Simpson, who live in our town and we train with every week. They got married in York and we spent the weekend there. I arrived on Bornholme on Monday evening, with plenty of time before the first race on Thursday. I missed TIOmila to concentrate on NOC, and that meant I was able to be fully recovered from my sickness. I did a couple of good sessions on Tuesday and Wednesday, and by Thursday I felt pretty good. I ran a good sprint race, and I think I picked all but one of the best route choices (missed the best route to number 12 by the sea front). I finished in 11th position which I was pretty happy with. The relay was the race I was most nervous about. Running first leg with Jon Duncan and Jamie Stevenson, it was the first time we had had a full strength GB team since I broke into the relay team. 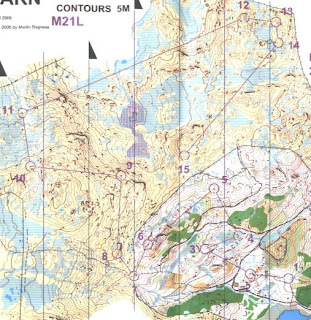 The start was manic, with the first 2 controls forked in some green forest. I managed to get through them, then it was a case of keeping up with the pack through some really fast open forest (very spring cup like). I didn't miss any controls and just kept up, then suddenly approaching the 11th control everybody seemed to be heading the wrong way. I assumed there was a forking and ran to my control. After that I seemed to be pretty much alone. After the next gaffle (in the green again) I was running on my own. I made a small mistake to the spectator control but went through in the lead. I really didn't want to mess it up after that and slowed down a bit - letting some other runners catch me up. I managed to make it to the last control first, but was overtaken on the run it. Jon and Jamie ran OK and we finished 6th. The middle race was a disaster, I was hopeless and lost time at lots of controls. I decided to take the classic easy, and maybe not even do it all after being ill before the champs. I just cruised round, and I was enjoying it so much, I ran the whole race (although I was well behind the winners). 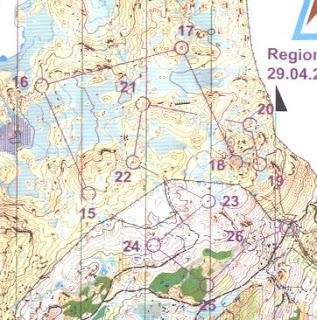 I really enjoyed the orienteering on Borneholm, although the island itself is a bit sleepy. This week Liis is moving back to Estonia, so we are spending a few days together. Then I am going to Sweden for a few days before a training camp in Finland with my club. Last night I ran a 10km road race around Silverstone Grand Prix track. 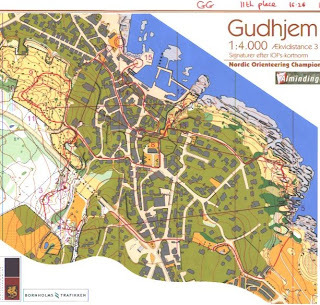 The course was exactly 2 laps, and the surface and lack of climb meant it was a very fast course. The only problem is that it is exceedingly exposed, so the runners really suffered a buffeting from really strong winds for a lot of the course. I wasn't sure how tired I would be after the Nordic champs, and I just went with how I felt during the race. I sat on the leaders in what I thought was a comfortable pace for most of the race, tucked in on their shoulders, then as the pace started to wind up at the end, I took the lead at about 8.5km. I went throught the 9km marker with maybe a 10m lead, but one guy had a really fast last km and destroyed me to the finish. I held on to 2nd place and knocked almost a minute off my PB to run 32.15. Without the wind, I like to think I can get well under 32. Liis ran well as well to get under 40 mins for the first time, finishing as 10th woman in 39.40.